Board of Missions of the Methodist Church , “Mission Photograph Album – Portraits #06 Page 058,” UMC Digital Galleries, accessed November 27, 2018, http://catalog.gcah.org/omeka/items/show/60382. Guerra was born in Reynosa, Mexico, and studied in the U.S. He ordination in the U.S. was in the Methodist Episcopal Church, South. 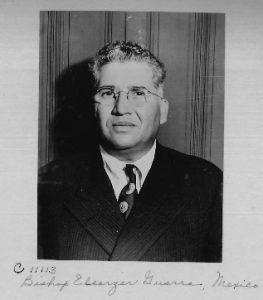 He became a district superintendent of the Methodist Church of Mexico and was elected the third bishop of the church in 1938. Although bishops served only a four-year term, he was re-elected in 1942, 1946, and 1950. He then served as secretary of evangelism and was elected to a final term of the episcopacy in 1958. He addressed the first General Conference of The Methodist Church and emphasized the continuing connection between autonomous churches like the one in Mexico and the rest of Methodism: “It is true that an autonomous church has been created in our country. … But we want to take part in this forward movement that this Church has taken, when all forces of Methodism are united for better service.” Guerra spoke at several General Conferences of The Methodist Church and in 1944 gave a comprehensive report on the growth of church membership, the strengthening of institutions, and the good relationships with U.S. missionaries. He again affirmed the need of both the U.S. and the Mexican churches to work together and said the church in Mexico was also engaged in ecumenical work with other Protestant denominations. Guerra died on September 14, 1970. Taken from Linda Gesling, Mirror and Beacon: The History of Mission of The Methodist Church, 1939-1968. (New York: General Board of Global Ministries, The United Methodist Church, 2005), p. 106.